Mezz Mezzrow (jazz musician): "What hit me about Twinkle [Davis], Alberta [Hunter], and another fine singer in the [Panama Cafe] named Florence Mills, was their grace and their dignified, relaxed attitude. Florence, petite and demure, just stood at easy and sang like a humming bird." Gilbert Seldes (1920s art critic and writer): "And Florence Mills, who died very young, is, after all these years, a great person in the memory of all who ever saw her. . . .When she sang, the whole of her person was engaged, so that even if I cannot remember her voice, I am still under the spell of her singing." 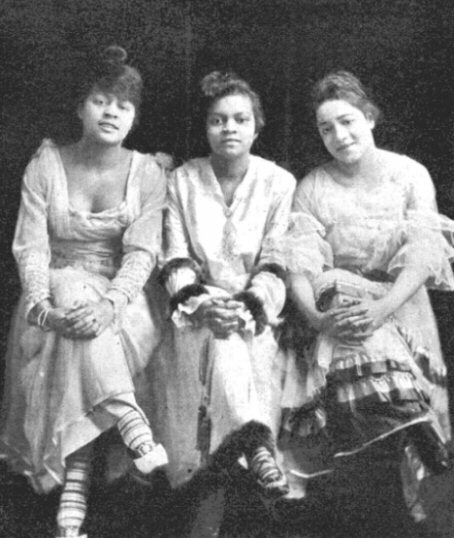 Alberta Hunter (blues singer): "Florence Mills became just as big a star as Bessie [Smith] but she was the opposite. She was a hummingbird, and dainty and lovely. Her little voice was as sweet as Bessie's was rough, and it was like a cello." Eubie Blake (Composer, ragtime piano player): "I'm Craving for That Kind of Love was a sensation in [Shuffle Along] as sung by Florence Mills. She began the number mid-stage, but then she would begin to creep down on the audience. By the end of the song she was at the footlights with the audience screaming and hollering." James Weldon Johnson (black intellectual leader): "And yet, after all, did she really sing? The upper range of her voice was full of bubbling, bell-like, bird-like tones. . . It was rather a magical thing Florence Mills used to do with that small voice in her favourite song, I'm a Little Blackbird Looking for a Bluebird; and she did it with such exquisite poignancy as always to raise a lump in your throat." Theophilus Lewis (Harlem Renaissance figure): "When she sings her song I'm a Little Blackbird she lets herself out, and - My God! Man, I've never seen anything like it! Not only that, I never imagined such a tempestuous blend of passion and humour could be poured into the singing of a song. I never expect to see anything like it again, unless I become gifted with second sight and behold a Valkyr riding ahead of a thunderstorm. Or see Florence Mills singing another song." Basil Maine (English music critic): Criticising the quality of voice production amongst English singers and actors, he went on to hold Florence up, along with John McCormack, as an exemplar of excellence; "Let me sing of Florence Mills, whose voice beguiles as it were an enraptured bird, whatsoever its plumage or lineage; beguiles, and saddens too, for the tones of it are all with pathos delicately edged. Her coloratura is as wide in range, as clean and sure in flight and descent as that of any ascetic prima donna." Irving Berlin (Quoted by C.B. Cochran): "I remember Irving Berlin saying to me regretfully when Florence was at the London Pavilion that if he could find a white woman to put over a song as Florence did, he would be inspired to write a hit a week." Heywood Broun (American drama critc): "The method of Florence Mills is like that of no one else. She does not precisely sing but she makes strange high noises which seem to fit in somehow with a rapidfire sort of sculpture. Sometimes the intent is the creation of the grotesque and then it fades into lines of amazing beauty. Now I have seen grace." Dudley Nicholls (American drama critic): "In her small throat she hides all manner of funny little sounds that flutter out like sparrows from an inexhaustible nest." Florence went to the Victor studios in 1924 for test pressings of Blackbirds and Dixie Dreams. Her friend Edith Wilson said later that that the old acoustic equipment made her small voice sound shrill and tinny. No trace of the tests exists in the current Victor archives. There were plans for recordings with the newer electrical technology when she returned to America in 1927 but she died too soon. Trivia: Everything you wanted . . .